Interestingly, these are all moons, not planets, and they are in the outer solar system, much farther from the sun than Earth is. Not the ideal location it would seem, but nature can be full of surprises. These discoveries have changed how we view habitablity when it comes to other planets and moons. Planets, ones with the right conditions for life as we know it, are good, but sometimes a moon can be ideal as well. In some cases, perhaps even better. 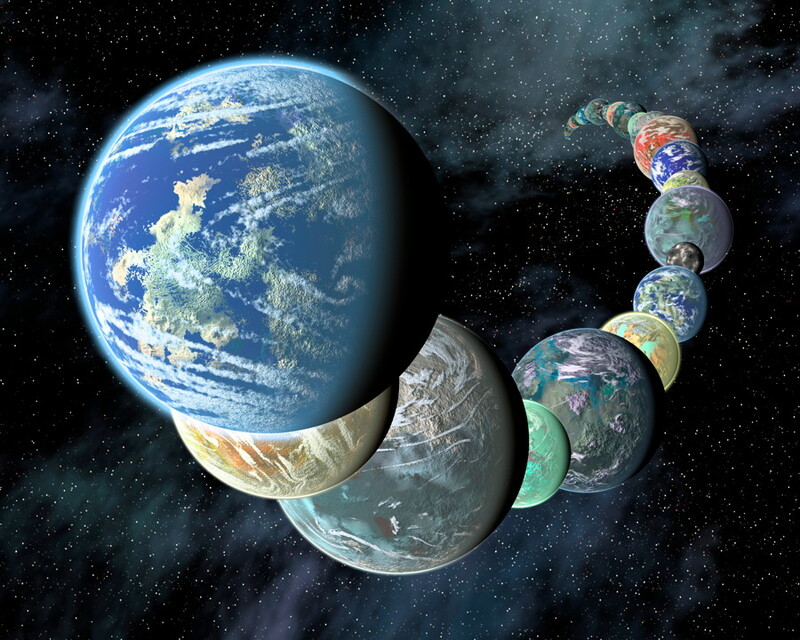 And if there are multiple such worlds right here in our own solar system, how many more might there be in other solar systems (with thousands of exoplanets already discovered so far orbiting other stars)? Let’s have a look at these alien moons and see what makes them so enticing in the search for extraterrestrial life. Europa, a moon of Jupiter, is considered to be perhaps the most likely place in our solar system, other than Earth, to support life. Below its frozen icy surface shell lies a deep ocean of liquid water, which is thought to cover the entire moon. The water is kept warm and liquid by the gravitational pull from Jupiter and maybe also radioactive heating of the moon’s interior. Other evidence now suggests that there are also subsurface lakes which are between the surface and the ocean below. It is also estimated that Europa’s global ocean contains more water than all of Earth’s oceans combined! The environment is quite similar to the ice-covered waters of the north and south poles on Earth. Life thrives in that water here, so could it also on Europa? The ocean bottom on Europa may be mineral-rich as well, providing an energy source for living things. The saltiness of the Europan ocean is also thought to be quite similar to the water in Earth’s oceans. Looking for evidence of living organisms would most likely require drilling through the ice by some future mission. Even if the only life forms were something like bacteria, it would be a momentous discovery. Will the first alien life found be Europan? Enceladus, a tiny moon of Saturn, was once thought to be just a frozen, relatively boring iceball. Too small to have enough energy to maintain an ocean like Europa. 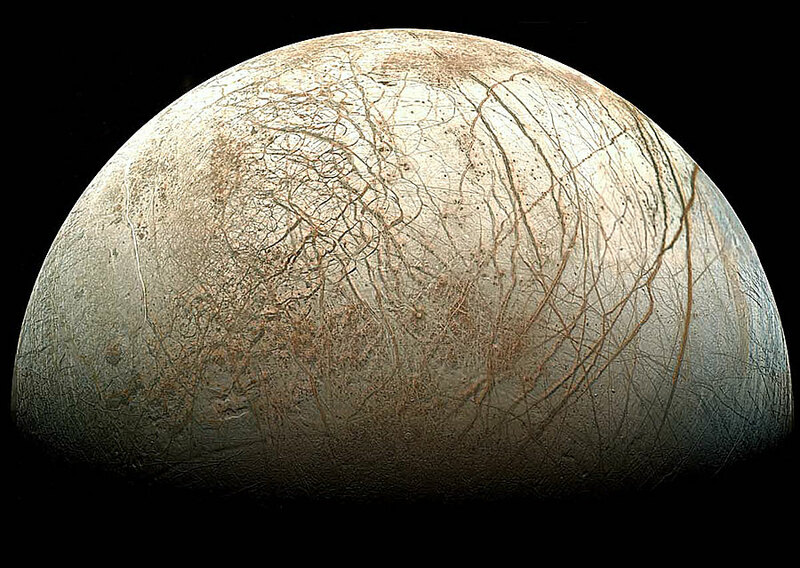 But the Cassini spacecraft found those ideas to be wrong; not only does this moon apparently have liquid water below its surface as well, it also has something that Europa doesn’t (as far as we know right now) – geysers. These giant plumes of ice, water vapour and organics are constantly spewing out into space from huge, warmer fissures in Enceladus’ surface at its south pole. The most recent evidence suggests that they emanate from a liquid water sea just below the surface. Cassini has already flown directly through these plumes a few times now, and sampled them as it did so. The discovery of the water and a variety of organic molecules in the plumes indicate a subsurface environment which may be quite hospitable for life. Looking for evidence of any such life might also be easier than searching on (or in) Europa; a future probe with the right equipment could take more samples from the plumes and examine them for direct signs of biological chemistry, which Cassini unfortunately can’t do. But just knowing that such a world exists opens up exciting possibilities. Titan is the largest moon of Saturn and, as it turns out, one of the most fascinating worlds that we know of. Cassini has revealed it be be a moon that is more like a planet, even Earth-like in some ways. It is a world of rain, rivers, lakes and seas. But the liquid on Titan isn’t water, it’s methane. The temperatures are far too cold for water to be liquid, but methane is liquid in these conditions. Titan has an entire methanological cycle that mimics Earth’s hydrological cycle. 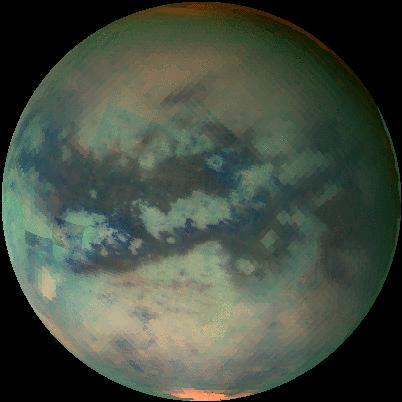 Titan’s atmosphere is mostly nitrogen, like Earth’s and is also rich in organic material. Generally, it is thought that such extreme conditions would make life next to impossible, but the possibility of methane-based life forms (instead of carbon like on Earth) has gained greater acceptance in recent years with some scientists. Some studies have even shown that something on Titan’s surface is reacting with the atmosphere in a way that is similar to that predicted for possible methane-based life. Could there be something like Titanian bacteria or is it just weird chemical reactions? Only further observations will help answer that question. I made a song inspired of this website. Let’s hear it. Oh I think that even now Mars is gone we can live on the moon. In fact, Dawfs already live on the moon so why can’t we live on the moon too?